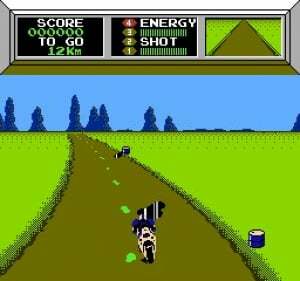 The action is fast and furious in this crazy motorbiking game. You have to blast your way through enemy vehicles and barrels on the track in addition to avoiding oil slicks. 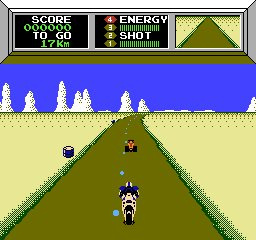 The pressure is always on to keep going fast to avoid enemies ramming into you from behind! Getting to the end of each course before the timer runs out adds another obstacle in the path to success. Although there is not a whole lot of lastability in this game, it is fun for an occasional short-term gaming session. Mach Rider's graphics and sound are average, even for the time it was made; however there is a real sense of speed at times, especially going around sharp corners. There are three modes of play – Fighting, Endurance and Solo. 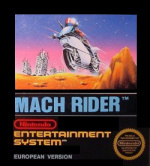 Fighting Mode is the one with the plot progression, simple and cyclical as it is, where you guide the Rider through 10 enemy-filled "sectors" on a quest to find the alien Quadrunners' secret base. Endurance Mode is similar, but removes the story in favor of focusing on the countdown clock – it's essentially a Time Trial mode. And Solo Mode is simpler still, again pitting you against the clock but also removing any and all aliens from the roadways. You ride alone. In addition to all this there is also a level creator as found in ExciteBike. The advantage in playing this game on the Wii is that your creations are retained in memory when you come back to the game another time. 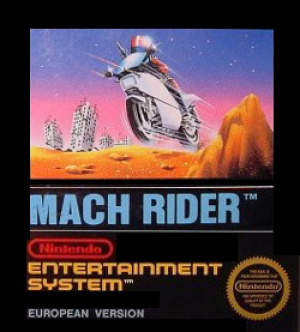 Mach Rider is by no means a bad game and it does have some nice ideas. It just doesn't have that spark to make it stand out from the rest. On the whole it is a pretty bland experience and probably only worth downloading if you are really curious, or enjoyed it back in the days.